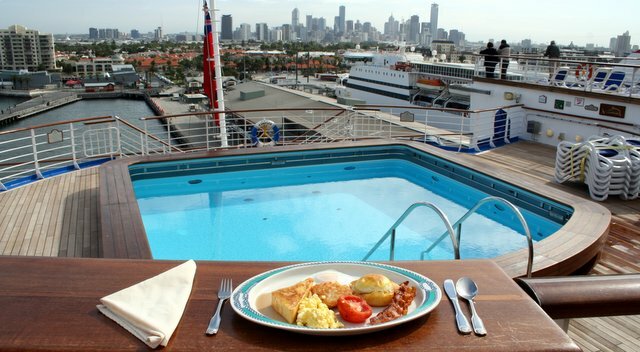 Fancy some eggs on the pool deck? This is what you can expect aboard the Diamond Princess, pictured here during a visit to Melbourne in February 2006. Not only can you get the old eggs benedict brulee (brown and crispy on top), but you also get to eat it off some very tacky nautical-themed plates with ropes swirling round the rim. Ahoy there, sailor. Norman (breakfast blogger senior) decided to sample a bit of everything for this photo-shoot, but he wasn't very impressed with any of it. It must be frustrating for school teachers when A+ students turn in A- essays. Johnny has lots of potential. If only he would apply himself more fully. Which is exactly how I felt this morning at La Luna, 320 Rathdowne Street, Carlton North, Tel +61 3 9349 4888. It's a very good spot for breakfast. With a bit more effort, it could be great. Let me explain. I had the La Luna Breakfast, and parts of it were great. The hollandaise, the sausage, the capsicum relish, the mushrooms and the sauteed spuds, to be specific. But parts of it were not great. The bacon, for example, still had the rinds on (lazy). The eggs were under-poached (sloppy). And the muffins (which I specifically asked to be replaced with toast) had no crunch. None of this was sufficient to ruin a good brekky. But it did undermine any hope of top 10 status. Which is a pity, because the potential is there. Service, for example, is excellent. Quick, polite, attentive and friendly. The venue is good too. A bit noisy when full, but where there's noise there's buzz. And the outside tables make La Luna both pooch- and puff-friendly. It's also quite hangover-friendly. Clean up your act with a berocca (tropical or original, how's that for variety?) Or get back on the turps with a glass of pink Domain Chandon bubbles, or maybe a bloody mary with tabasco, worcestershire, cucumber and a secret blend of herbs & spices. 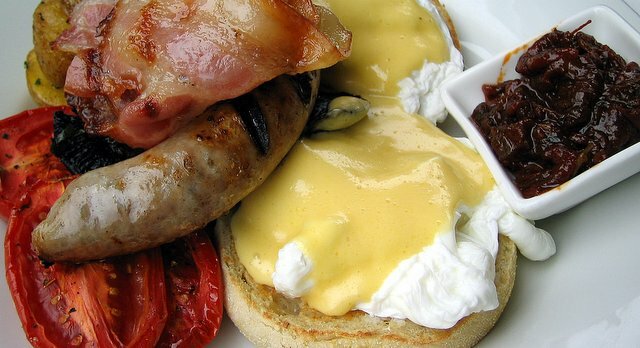 Plus, the menu boasts no fewer than 7 dishes with hollandaise. Just don't forget your gold card. 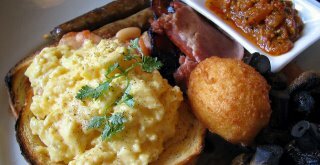 The La Luna Breakfast will set you back $17.50 and the brunch menu has bangers and mash at a scary $28.50. Today we had a mini blog-in at Mart 130, where Ed, Ange and I exchanged tips on how to balance your tripod on top of an upturned glass, and the merits of cats and cleavage as food-blogging side dishes. No sign of Tara today, but the corn fritters were delicious. So much for the wisdom of crowds. This morning I followed the crowd to e Gusto, Southgate, Tel +61 3 9690 9819, where I was treated to the worst eggs benedict I've had in recent living memory. The eggs were poached solid, and the whole thing was coated in some bland, pale, pastel whitish-yellow "sauce" which they assured me was house-made hollandaise (I asked... twice). Amazing. 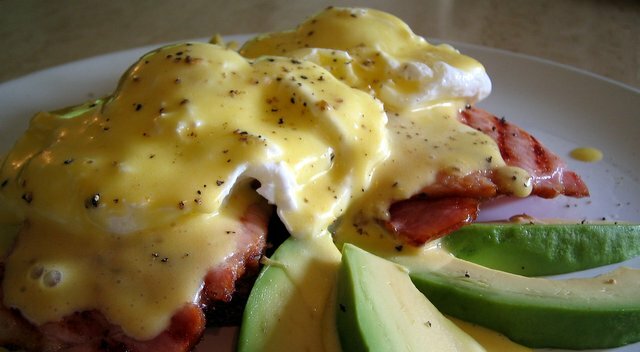 House-made hollandaise that was almost indistinguishable from the stuff you might expect to find on a supermarket shelf. No doubt the surfboard-shaped hash brown was house-made too. Unfortunately, It's hard to say anything nice about e Gusto's breakfast performance. The service was so-so. There was a draft running past my tiny table, jammed against the kitchen wall. And I really can't get the whole "hollandaise" thing out of my head. Mmm... mushed egg multi-seed bagel from Glick's, Flinders Lane, Melbourne. 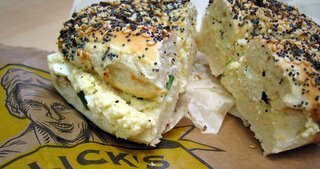 The only place for bagels in Melbourne. Apart from one of the other Glick's stores, of course. It's a dangerous time to be a cartoonist (especially a Danish one). So I wonder how the French will feel about the female caricature adorning the menus at Madame SouSou, 231 Brunswick Street, Fitzroy, Tel +61 3 9417 0400. Dressed in period gear, with one hand up in the air, the other hand appears to be wedged firmly up her derriere. Are they trying to imply that French women have worms? Is that the dirty little secret behind French Women Don't Get Fat? Assuming it doesn't get ripped apart by rioting Frenchwomen in the weeks ahead, one thing's for sure... this is a good place for breakfast. My SouSou breakfast was anything but so so. Firm, buttery scrambled eggs. Delicious double-smoked bacon. Golden, crumbling, house-made hash browns. Roasted tomato, fresh avocado, and crunchy sourdough toast. Yum yum. Other interesting items on le menu du petit dejeuner include ricotta pancakes with warmed strawberries, honeycomb, and vanilla bean butter; Madame SouSou's toasted fruit and nut muesli with apple and berry compote, and sheep's milk yoghurt (no, Yoplait isn't really French for yoghurt); and sweet corn fritters with smoked salmon, avocado, tomato salsa and creme fraiche. Or, if you want to get all French, there's a selection of croissants, with shaved ham, cheese, blah blah blah... and a rather fancy sounding pear, fig and walnut "French" toast, with cinnamon marscapone and clover honey. The venue is stylish without being stuffy, and the staff look very snazzy in their white aprons and black pants. But if you're on an outside table (as I was), there's a risk of being out-of-sight, out-of-mind. It took me a while to order a second coffee. My only other comment relates to price. At $17 for the signature breakfast, it's just a tad too expensive to be good value. This is, however, a close call. And I will come back for more. 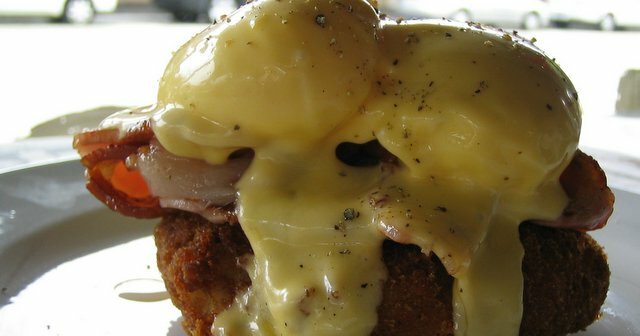 16/20 "mmm... double smoked bacon"
If there's a Sydney equivalent of St Kilda's Galleon Cafe, then I think it's Three Eggs, 100 Brighton Bvd, Bondi Beach, Tel +61 2 9365 6262. It has the same shabby charm as the Galleon, the same around-the-corner-down-the-road obscurity, and (it seems) the same loyal fan-base of locals. It also does a mean breakfast. 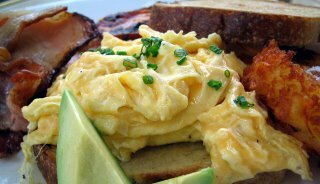 My parmesan scrambled eggs with bacon and avocado were most enjoyable. Good scrambles, pretty good bacon (enhanced by HP sauce), ripe avocado, and two slices of an excellent white toast... crunchy on the surface, yet dense and soft at the core. 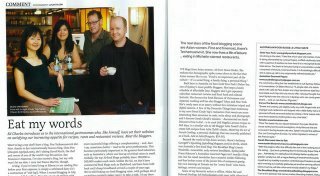 The coffee was very good too. Of course, food tastes better when you feel good. So the friendly staff, buzzy vibe, and a bright red feature wall each play a part in the Three Eggs experience. My only complaint was that on a sticky day (like today) the place gets a bit hot and stuffy. 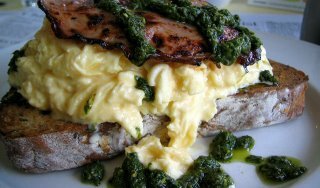 Other noteworthy egg dishes include a goat's cheese omelette with mushrooms, spinach and sage; and a poached egg with prosciutto-wrapped asparagas, parmesan and balsamic. Sweet-tooths may prefer the buttermilk pancakes with hazelnut butter, banana and date syrup. Or maybe raisin toast with marscapone, walnuts and honey. 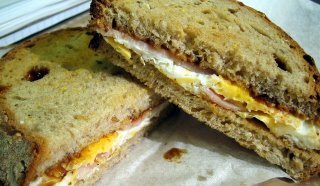 Mmmm... egg n bacon toasted sandwich with HP sauce. The first step in my three step plan towards dehangoveration. Step 2 was a soothing capuccino. Step 3... repeat step 2. It's not fancy, but they do good toast at the Art Deco Cafe, 18 Queen Street, Melbourne, Tel +61 3 9614 0050. Good coffee too. I have been known to say that breakfast is the weak link of Italian gastronomy. This morning, Replete Providore made me eat those words. Say hello to Eggs Bagna Cauda. 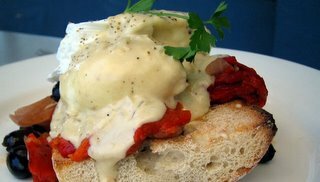 Perfectly poached eggs with an olive and capsicum stew under a blanket of bagna cauda... a magnificent Italian anchovy-butter sauce. Fusion food never tasted so good. I'm not normally a huge fan of the anchovy. But infused through the bagna cauda, its flavour is transformed from fishy-frenzy to salty-subtlety. Those Piedmontese give good sauce. So, if you can't make it to Turin for the Winter Olympics, you can still bring your own little piece of the Piedmont to Melbourne. Go the Eggs Bagna Cauda at Replete, pop the cork on a nice Cà Viola Barbera (I highly recommend the Bric Du Luv 2000), and plonk yourself in front of the telly for some quality time with Bruce. 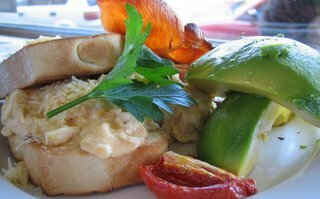 If there's one place that most consistently follows the words "you should try..." it would have to be the Turtle Cafe, 1 Ormond Road, Elwood, Tel +61 3 9525 6952. So this morning I did. I wasn't at all impressed with the coffee, but the Turtle Benedict was very good. They describe it as poached eggs and bacon on house-made bubble and squeak, topped with hollandaise. But it's more like potato croquette than what I would call bubble and squeak... even if they do slip a couple of peas and a bit of carrot into the mix. In any event, it's all good. The eggs and hollandaise, in particular. But the coffee left a bitter taste in my mouth... literally and figuratively. The first cup had that dirty, bitter, watery taste that I normally associate with a skim milk cappucino. After a few brave sips I sent it back, on the assumption they I'd received a skinny by mistake. But the second cup was much the same, so I'm struggling to understand how such good coffee (Genovese) could be made to taste so bad. The Turtle lives in a funny old wedge-shaped building in the middle of a multi-road suburban junction. Kind of like a cross between New York's Flatiron building and an abandoned slum house. But despite the run-down feel (or perhaps because of it) there's a steady stream of punters who keep coming back for Turtle eggs, pancakes, pikelets, and more. As Channel 9 pins its hopes on Eddie McGuire to stop the ratings slide, Silo Bakery is "Still the One" for a top notch Canberra breakfast. And while Eddie ducked into Bambini Trust to celebrate the new job (before the official announcement on the 6pm news), I tucked into a very nice gruyere omelette at Silo. Even better than I remembered. After this morning's visit, I think I'll have to upgrade Silo to 17/20, with a couple of extra points for coffee and extras compared to the original score. Apparently someone bet Dr Seuss $50 that he couldn't write a book using 50 words or less. Green Eggs and Ham won him the bet. I'm almost tempted to bet $50 that I just had the best plate of green eggs and ham Melbourne has to offer. The venue? Cafe Zest, 55 Beach Street, Port Melbourne, Tel +61 3 9646 9182. Nice bayside views, too. As Mark Twain once wrote: "Nothing helps scenery like ham and eggs... Ham and eggs and scenery... these make happiness." On this score, Zest is a very happy place. The scrambled eggs and seared ham were great, and the pesto gave the dish a real kick. What Twain forgot to say was: "Nothing helps breakfast like good coffee. 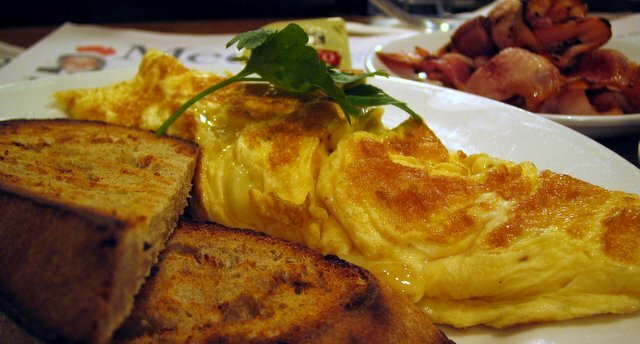 Ham, eggs and a double-shot cappucino... these make a perfect breakfast." Zest scores again. The Amici coffee was excellent. I can only speculate about the rest of the food, having neither viddied nor tasted it. But it all sounds promising: coconut & cinnamon or vanilla chai porridge; lemongrass creamed rice with poached pears; French toast fingers with marscapone and lemon scented apple; hazelnut pancakes with berry compote, strawberries and marscapone; a smoked salmon thingy on sweet corn fritters; and shakshukah (Middle eastern eggs in tomoato sauce, apparently). 16/20 "ham, eggs and scenery"
After spending several hours (OK, maybe it was more like 45 minutes) trying to find the Boathouse, somewhere on the banks of the mighty Maribyrnong River, I was delighted to discover that (a) Vodafone has apparently never heard of it; (b) they stop serving breakfast at 11.30 (flashback to Canberra in the 90s); and (c) we couldn't have a table because they were getting busy with the lunch crowd and they didn't want to compromise the quality of the dining experience. Great. Trek out to woop woop and get rejected. So we went looking for a proper breakfast venue. 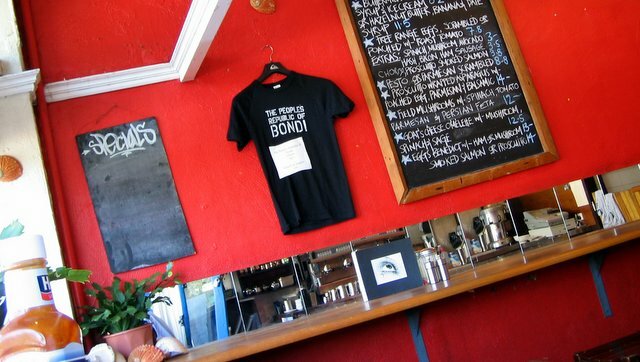 And we found Blush Foodroom, 43 Epsom Road, Kensington, Tel +61 3 9376 1222. Apart from some woody old mushrooms, my big breakfast of scrambles, bacon, sausages, spicy relish, potato fritter and toast was very good. The poached googs were also good, but not consistently so. One of ours was over-done. On a sweeter note, they did a very tasty plate of banana pancakes, with lime and pineapple syrup and white chocolate ice-cream. The toasted muesli with vanilla and brown fig also sounded interesting. 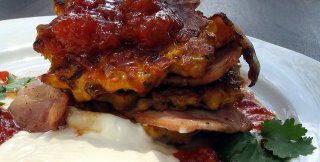 And as we were leaving, I eye-balled a towering stack of cinnamon French toast with whipped orange butter, berries and maple syrup. Worth coming back for. It was stars galore this morning at Mart 130, 107a Canterbury Rd, Middle Park, Tel +61 3 9690 8831. First, we snare a table right next door to Slashie-award winning model-slash-author Tara Moss, who seemed to be enjoying her scrambled eggs. Then, as we're leaving, who should roll up in his groovy black Jag but Academy-award winning animator, Adam Elliot, aka Harvey Krumpet. This place is paparazzi paradise. Great for breakfast, too. Days after I dish out my best corn fritters award, along comes Mart 130 to make me look stupid. Yes, that's right. 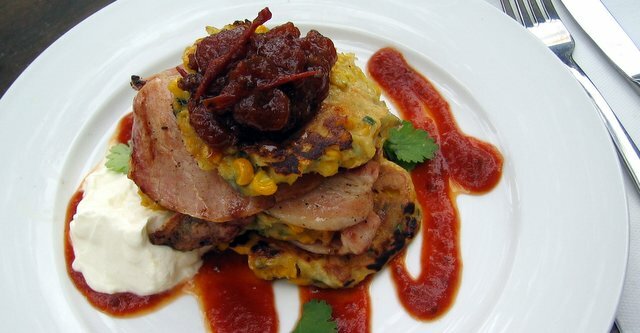 This morning's corn fritters were definitely equal to, and probably a whisker better than those at Replete Providore. And that's quite a feat. I think it was the quality of the corn that did it. Fresh from the cob, and noticeably so. Plump, juicy, tasty little kernels, bound together in a fritter stack, with bacon, relish and sour cream. As Richie Benaud would say... Marvellous. Not only is the food good, but it's cheap. House made baked beans with ham hock on sourdough toast (excellent toast, by the way), under $9. Poached free range eggs with asparagas, mushrooms, hollandaise and chives, under $10. Mart granola or bircher muesli, under $7. Or Pancakes with berries and lemon yoghurt, under $10. And then there's the venue. If Bills is Sydney, then Mart is Melbourne. It's hidden away so you can't find it (at least, not without a few pointers from someone in the know). It's not a rip-off. And it doubles as a tram stop. Ding ding. Grab a spot on the back deck and soak up the Albert Park views... Marvellous. Rounding out a star performance, the Mart team was very friendly, with great attention to detail. Good coffee (Genovese) and OJ too. My only small gripe was the portion size. My serve of scrambles and beans was a tad skimpy. Of these, my personal favorites are Las Chicas, Replete and Mario's (of course). And now, thanks to the magic of push-button publishing, I can add Mart 130 to this list, almost as if it had always been here.